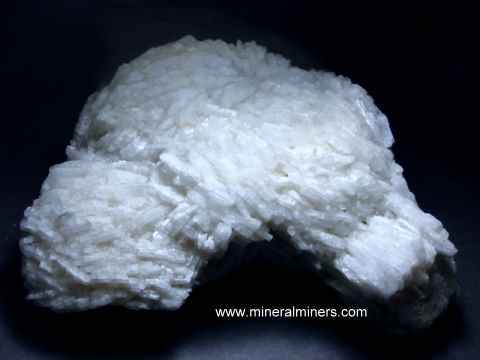 Try our Albite Mineral Specimens Satisfaction Guarantee - compare our pegmatite specimen prices and our superior quality. Click on any clevelandite or albite feldspar specimen image below to enlarge it. Pink Tourmaline in Matrix Specimen Dimensions: 2.8" x 1.9" x 1.5"
The matrix of this natural pegmatite specimen is albite feldspar. There are several natural color pink tourmalines. Clevelandite Specimen Measurements: 3.7" long x 2.8" x 2.2"
This specimen is composed of intergrown white clevelandite crystals. Clevelandite is a blade-like variety of albite feldspar. There also are some small golden muscovite crystals and a few tiny 2-3mm cubic pyrite crystals as shown at left. The photo at left is a close-up, see also a full view photo of this albite mineral specimen. Pegmatie Specimen Measurements: 3.7" long x 3" x 2.6"
This specimen has a matrix of white clevelandite crystals. Clevelandite is a blade-like variety of albite feldspar. There are hexagonal muscovite crystals intergrown on the specimen's upper surfaces. Pegmatite Specimen Measurements: 4" long x 2.9" x 1.5"
The matrix of this specimen is white clevelandite (a variety of albite feldspar) with blade-like form with several dozen tiny dark tourmalines perched on top of the clevelandite. There are some terminated quartz crystals on the back side. The blade-like clevelandite crystals are mostly translucent and become transparent at the crystal tips with vitreous luster. Pegmatite Specimen Measurements: 6.5" long x 3.5" x 2.5"
The matrix of this natural pegmatite mineral specimen is a flesh colored microcline crystal section that is intergrown with a mass of snowy white blade-like albite crystals (albite feldspar with blade-like form is known as clevelandite). Pegmatite Specimen Measurements: 4.2" long x 4" x 1.9"
This pegmatite decorator specimen is composed of brilliant snowy white clevelandite crystals (a variety of albite feldspar) with some golden muscovite crystals perched on the clevelandite. The blade-like clevelandite crystals are translucent to semi-transparent with vitreous luster and become transparent near the crystal tips. Beautiful terminated clevelandite crystals cover the backside as well (see a back view of this muscovite on clevelandite specimen). See also a full view photo of the front side of this muscovite on clevelandite. Pegmatite Specimen Measurements: 4.8" long x 2.8" x 2.3"
The matrix of this natural pegmatite specimen is a mix of the two feldspar varieties white albite and beige microcline. There is a small amount of green tourmaline present as well. The photo at left shows a close-up of a 0.4 inch long green tourmaline crystal perched on top of the albite. There are some small brilliant clevelandite crystals in some areas. The tourmaline crystals are dark green with semi-transparent areas when held to a light. See a full view of this natural albite with tourmaline specimen. Natural pegmatite matrix specimen weighing 2 pounds! Pegmatite Specimen Dimensions: 5.2" long x 3.6" x 6"
The matrix of this natural pegmatite decorator specimen is albite feldspar with intergrown muscovite mica. There are a few dozen small green tourmaline crystals perched on top of the albite. See a full view photo of this natural pegmatite mineral specimen of tourmaline on albite. Pegmatite Specimen Dimensions: 4.7" long x 3.7" x 1.9"
The matrix of this natural pegmatite decorator specimen is albite feldspar. There is a pink and blue tourmaline crystal embedded in the upper surface of the albite. The tourmaline is partially replaced by lepidolite. Clevelandite Specimen Measurements: 7.7" x 5" x 3.5"
This unique decorator specimen is a mass of blade-like clevelandite crystals with very pale blue natural color. There are a few dozen small green tourmaline crystals (up to about 0.3 inches long) perched on top of the clevelandite. See a close-up view of this natural decorator specimen of green tourmalines on clevelandite. Pegmatite Specimen Dimensions: 4.9" long x 3.4" x 2.7"
The matrix of this natural pegmatite decorator specimen is albite feldspar with intergrown quartz. There are some deep pink tourmaline crystals embedded in the albite, and two of them are watermelon tourmalines with a green core surrounded by a pink rim. See a full view photo of this natural pegmatite mineral specimen of tourmaline on albite. Pegmatite Specimen Dimensions: 7.5" long x 5.5" x 4.5"
This natural pegmatite decorator specimen has a group of naturally terminated smoky quartz crystals partially embedded in a matrix of white albite feldspar with some muscovite mica. The albite matrix is a mass of intergrown triclinic albite crystals, some of which show curving surfaces. See a close-up of the albite feldspar matrix. The smoky quartz crystals are semi-transparent to transparent with all natural terminations in mostly good condition with a few minor abrasions, and the largest smoky quartz crystal measures over 5 inches long! See a side view photo of this superior quality smoky quartz on albite decorator specimen. Pegmatite Specimen Dimensions: 7.7" x 7.7" x 4.7"
The matrix of this natural color pegmatite decorator specimen is white albite feldspar. There are dozens of pink tourmaline crystals intergrown with the white albite matrix. The pink tourmalines are mostly translucent. This unique decorator specimen is completely natural just as it came out of the earth - it has not been heated or treated in any way! Pegmatite Specimen Dimensions: 12" x 11.5" x 5.5"
The matrix of this natural color pegmatite decorator specimen is white albite feldspar. There are more than 100 pink tourmaline crystals intergrown with the white albite matrix. The pink tourmalines are mostly translucent. This beautiful decorator specimen is completely natural just as it came out of the earth - it has not been heated or treated in any way! See a full view of this natural decorator specimen of pink tourmaline crystals in albite. There are beautiful pink tourmaline crystals exposed on the opposite side as well! 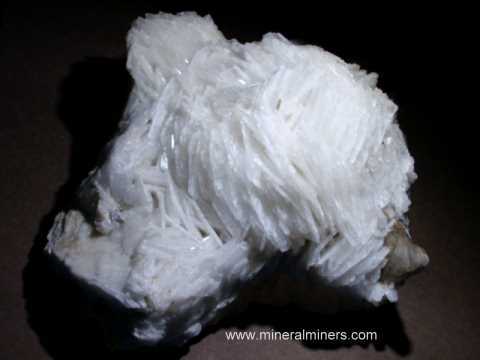 See also an opposite side view of this natural decorator specimen of pink tourmaline crystals in albite. Clevelandite Specimen Measurements: 7" long x 6" x 3.5"
This natural pegmatite specimen is a mass of intergrown white blade-like clevelandite (a variety of albite feldspar) crystals. The clevelandite crystals are translucent to semi-transparent and they crystallized in rounded masses. See also an opposite side view of this natural clevelandite decorator mineral specimen. On the base of this natural pegmatite specimen there is some small muscovite micas and a few tiny columbite-tantalite crystals - the largest measures about 1/4 inch across. See a close up of the largest of these Columbite-Tantalite in Clevelandite. We also have in stock giant albite decorator specimens weighing over 1000 pounds each & giant pegmatite decorator mineral specimens! We carry an assortment of stands for small & medium sized minerals. See also our Pegmatite matrix specimens page. This is the end of our Albite Mineral Specimens and Clevelandite Crystals page. We do have additional inventory of natural albite matrix specimens including giant size fine quality albite and clevelandite decorator specimens weighing over 1000 pounds (ask us for photos)! Just let us know if you have any large clevelandite specimen requests. To see more albite photos, just select another item category from the table below. To see photos of another mineral variety, select any item category link in our Mineral Inventory & Factsheet Index. Would you like us to inform you when we add more natural albite matrix pegmatite mineral specimens and clevelandite crystals on this page? We do have additional inventory of natural albite mineral specimens in stock, so be sure to let us know if you have any albite or clevelandite special requests. Please contact our webmaster or our 'site' geologist with any questions or comments regarding albite feldspar mineral specimens.